I love jumping into these SNES games with absolutely no idea what to expect. 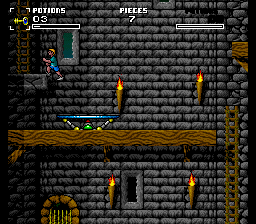 Dream TV comes from Triffix, a company I recognize immediately for a curious NES title called Castelian, a.k.a. Tower Toppler. 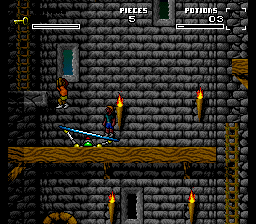 Dream TV is apparently a split-screen 2-player adventure action game. 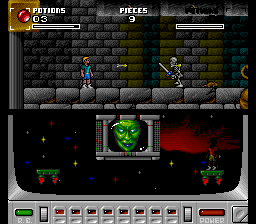 But with no second player, it becomes a tad annoying that the lower half of the screen is occupied with the visage of your adversary who has put you up to the challenge at hand. The TV seen in the lower half — ostensibly the eponymous Dream TV — sends you on a mission through different worlds starting with Medieval World to recover puzzle pieces. It’s nice to have a goal. But it’s frustrating to only deal with half the screen. Fortunately, I accidentally discovered that ‘select’ offers the single player the full screen real estate. There were at least 4 different types of keys. If I wanted to open a door, I had to try the key I was already holding. If the key didn’t take, go through that see-saw rigmarole to get back to the dangerous key forest to get another type of key, and try to remember which keys I had already tried. Still, I gave it a good shot because I was eager to see what else I could possibly figure out about the game. 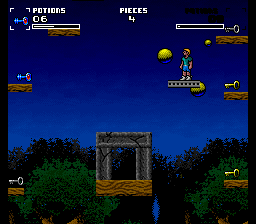 Some brief Googling indicates that no one has any more clue about this game than I do. No matter what obscure game I can find for the NES or SNES, it seems there are some videos for it on YouTube, often with some very unfunny commentary. This game is no exception, with 2 such videos. I had the persistence to figure out more about this game than either of those 2 players. Don’t think that I’m bragging; on the contrary, this might be a good way to simplify future obscure SNES game entries. Hey I know this post is kinda old but this was an interesting read but not much of a review but I liked reading this regardless. I also found nothing on this game besides a few videos that helped slightly. I can’t seem to figure out the teleport function or the X button that seems to do nothing for me. Anyway nice write up on a weird game lol.